At Johnny’s Restaurant, you have the luxury of enjoying both—Greek food and Southern-style food—at once. Stop by the Pink House and its secret garden; it’s been a landmark in this town since 1921. Ernest Hemingway and F. Scott Fitzgerald are just a few of the famous American writers this house has hosted. Staff Photographer Steve Klise and I traveled to Homewood, Alabama, to find out what happens when Greek food meets Southern food. Let’s just say it’s a beautiful sight to witness and a wonderful experience to revel in. Thanks to chef-owner Timothy Hontzas’s menu at Johnny’s Restaurant—which is built on “Southern ingredients and Greek technique”—our version of their Greek Baked Chicken will make any home cook lust after more cuisines that marry different cultures. ON A WARM FEBRUARY afternoon, I join the line that snakes out of Johnny’s Restaurant, a second‑story lunchroom in a well‑dressed strip mall in Homewood, Alabama. Johnny’s is what’s known as a meat‑and‑three: a restaurant offering a protein and three side dishes for a fixed price. The menu is built on “Southern ingredients and Greek technique,” as chef-owner Timothy Hontzas puts it, a nod to his Greek heritage and Alabama upbringing. A “Greek‑and‑three,” he says. At Johnny’s, items such as souvlaki are listed on the menu next to fried catfish and hamburger steaks. This subtle intermingling of cuisines has long been standard for Greek eateries in the South. “We laugh and say, if it hadn’t been for the Greeks in the ’60s and ’70s, the people of Birmingham would have starved,” Hontzas says. He speaks with a twang and moves with purpose, breaking often from conversation to greet patrons—including his cousin Teddy Hontzas, who also runs a restaurant in the area. “[Greeks] had all the restaurants, but they weren’t screaming, ‘Hey, look at me—I’m serving tiropita, spanakopita, pastitsio, and keftedes.’” Instead, Greek restaurants served the Southern-style food of the community, slipping in a Greek dish here and there. Hontzas points to a framed menu on the wall from Johnny’s Restaurant of Distinction, his grandfather’s 1950s Jackson, Mississippi, restaurant, which he owned with Hontzas’s father and uncle. Among the illustrations of steak and gumbo and a mermaid riding a lobster, one of the only discernible Greek dishes is an Athenian salad. Price: $1.00. Hontzas points to a framed menu on the wall, which features the $1.00 Athenian salad mentioned above. Marrying Southern and Greek food together, that’s what I love to do. From hospitality to food, the cultures are very much alike. When the family’s ancestors came to the South from the village of Tsitalia in the Peloponnese region of Greece, they tried to create their own new village, bringing saplings from fig and olive trees to plant in their yards, grape vines to grow along their fence lines, clippings of oregano and mint to season their food—little flavors of home. Hontzas has the descendants of some of these plants in his own yard today, and his great-uncle still sends him freshly dried oregano from Greece. This generational transfer of food traditions is enough to give him “chill bumps,” he says. Insider tips: Johnny’s is closed on Saturdays, which is just unfortunate. If you go on Sundays, it’s best to go early to beat the church crowds. Three separate congregations descend on Johnny’s between 11:30am and 1:30pm. You're going to want some crusty bread to sop up the savory, herby pan sauce. There’s nothing wrong with pimento cheese sandwiches, but why limit the range of this tangy, creamy cheese? These ultratender, superflavorful long-cooked green beans are definitely not al dente—and in this case, that's a good thing. Don't forget to save a place on your plate for this cheesy, spicy side. What are your favorite sides to include in a meat-and-three? Let us know in the comments! 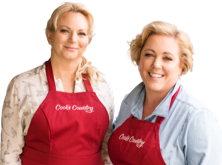 Don't forget to check out Cook's Country Takes America for more recipes inspired by our miles on the road (and in the air).